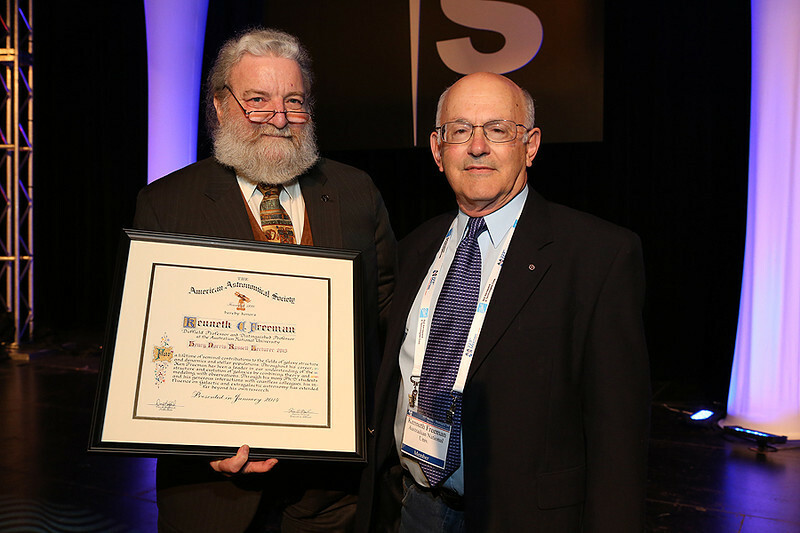 Kenneth C. Freeman (Australian National University) was awarded the Society's prestigious Henry Norris Russell Lectureship for a lifetime of seminal contributions to the fields of galaxy structure and dynamics and stellar populations. Freeman gave his Russell Lecture , "New Developments in Galactic Archaeology," on Monday afternoon after being introduced by AAS President David Helfand (Quest University Canada). Kenneth C. Freeman (Australian National University) was awarded the Society's prestigious Henry Norris Russell Lectureship for a lifetime of seminal contributions to the fields of galaxy structure and dynamics and stellar populations. Freeman gave his Russell Lecture , "New Developments in Galactic Archaeology," on Monday afternoon after being introduced by AAS President David Helfand (Quest University Canada). AAS photo © 2014 Joson Images.